How hard is it to get out of bed in the mornings these days? To spend the rest of winter horizontal, snuggled up and warm, with a servant who brings you mugs of hot tea and butternut squash soup? Yes, please. This phenomenon is totally natural. Since the days of the cavemen, the cooler weather sends a signal to our bodies to conserve energy. Even in this day in age, when our busy lives seem to demand constant energy, that winter sleepiness is hard to fight . 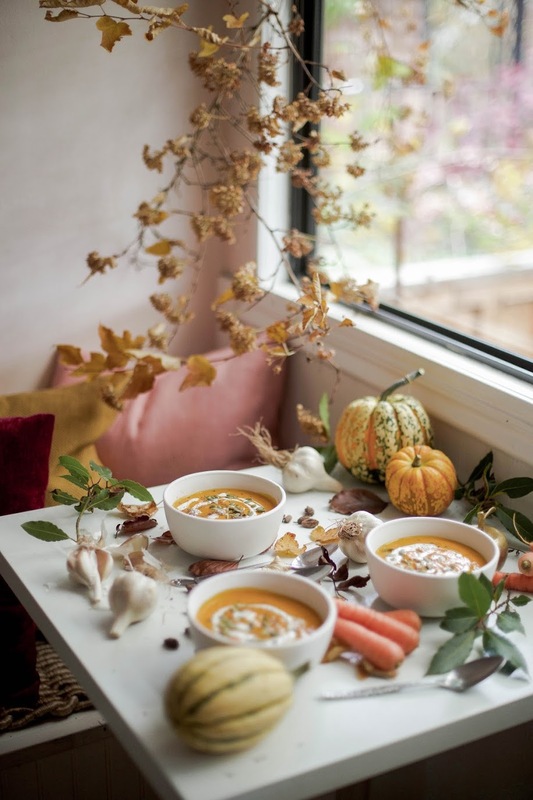 At Nourish, we firmly believe in listening to your body as the seasons change. That high energy, spontaneous fire you felt in the summer? Put it to bed if your body asks you to. Slow down, cuddle up, and Nourish your body with warm, hearty foods and beverages. Settle into your home, and create nourishing rituals & routines. Take your time, don't expect too much of yourself. Make soup! The rain was coming down pretty hard on the day we made this hearty soup, and the flavours of cardamom and ginger paired perfectly with the mood. This dish makes the perfect simple mid-week dinner, but it's strong, warming flavours could also make it the perfect first course for your holiday gathering!! Dice onion & celery. Mince garlic & ginger. Grind cardamom pods, if needed. Sauté onion & celery in a large soup pot with a splash of olive oil over medium heat. Once onion is translucent and celery is softened, add garlic, ginger & cardamom and continue to sauté until fragrant. Add remaining ingredients and simmer for 25 minutes. Puree the soup using an immersion blender. If desired, only puree half the soup for a chunky/smooth texture! Add salt and pepper to taste. Garnish with a drizzle of coconut milk, roasted pumpkin seeds, and/or a pinch of ground cardamom if desired. Serve & enjoy!